After a previous day and most of the night raining the Lakewood course offered a very wet field on which to race. With numerous sharp turns on slick footing it was hardly an auspicious time to attempt a fast time but inclement conditions and all there was Amy-Eloise Neale hurtling down the final grade onto the track and it still seemed possible that she could break her own course record. The record, which was set on a dry course two weeks ago in the Hole-In-the-Wall Invitational , certainly received a challenge but eluded Amy by a mere two seconds. The time, given the circumstances, on a course that had to have been at least 15- to 20 seconds slow certainly attests to the fact that the Glacier Peak star is in excellent condition. The 3A girls’ race for WESCO saw Amy-Eloise take an almost immediate lead and by the time that she had left the stadium, Neale already had established a two second lead over her team mate Katie Bianchini, who is one of the top runners in the state – regardless of level. The leader left the stadium at the 1:55 mark in the race & headed into the wooded area in the back portion of the course. That section, unfortunately was also the wettest portion, and Amy came back into view at the 5:40 mark, which was near the mile mark in the race. A quick glance on her face showed her determination to race in spite of the elements. Katie for her part ran well ahead of the third place runners, yet another Glacier Peak runner – Marlee Rothschild, who had a firm grasp on that position. The runners raced back by the starting line and did a loop of the baseball diamond before heading back to the track. By the time that she left the stadium for the second time at the 9:58 mark, Neale held a 25 second lead over Bianchini, who in turn held a 25 second lead over Rothschild. The team race was pretty much in control for GP at that time as well, because The Peak also had runners in fifth, sixth & ninth position. Amy-Eloise rolled home in a very quick 17:48, which on most days would have translated into a stunning time, while Katie Bianchini followed with 18:40. Marlee Rothschild more than likely would have been under nineteen minutes, as well, but her time of 19:20 still gave her a fifteen second margin over her nearest competitor. That said Gigi Vujovich of Shorecrest closed well to take fourth in a time of 19:35. The freshman finished five seconds ahead of Haley Suarez of Meadowdale, who also came on late and finished well. Glacier Peak runners Megan Davis (19:42) & Marren Haneberg (19:43) garnered the next two places, while Rachael Lefsted of Marysville-Getchell claimed 8th in 19:56. Samantha Northrop (20:01) & Katherine Dittman (20:201) added ninth & tenth efforts for Glacier Peak and Hannah Bressler of Oak Harbor secured eleventh in 20:23. There would be no surprise in the team scoring, as Glacier Peak is the top team of any division in the state. The final total saw Glacier win with a low of 19 points. Oak Harbor, which also received 12th & 13th place finishes from Christina Wicker & Heather Dale respectively, took second place with 66 points. Marysville-Getchell edged Shorecrest for third: 101 - 102. In the 4A girls’ race Henry Jackson runners Brooke Klingma, Jessica Rawlings & Kelsey Fruland got out well along with Megan Bull of Monroe. The leaders left the stadium at the 2:07 mark and then reached the mile in approximately 6:04 but during the next mile a number of Snohomish runners weaved their way through the chase pack. 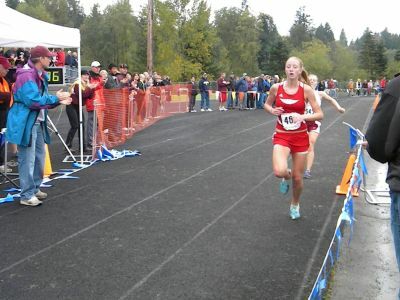 Leading the Snohomish charge was Bri Gibson, who is but a freshman. Bri took the lead and then rolled to victory in a final time of 19:09. Brooke Klingma finished alone in second with a 19:27 and Jessica Rawlings earned third ten seconds later. Kamiak freshman Tiana Roe, who was never too far off of the lead early claimed fourth in 19:42. HJ fortunes seemed fairly secured after Kelsey Fruland added a fifth place finish for the team with a mark of 19:43 and then Megan Bull took sixth in 19:47. Stanwood runners Jordin Stephenson & Jade Horseth followed in 7th & 8th respectively but then the complexion of the team race changed radically after Snohomish runners Hailey Nyquist (20:10), Hannah Berstein (20:17) & Shelby Mills (20:21) swept the next three places. Megan Alfi of Edmonds-Woodway briefly stemmed the red tide of Snohomish with her 12th place finish but then Jenna Alleman of Snohomish garnered 13th. 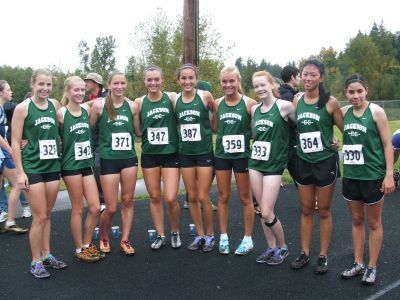 Lauren Briggs gave HJ another chance to take control, when she secured 14th but then Snohomish runners Alexandra Deher & Leiran Cornish salted away the team triumph with their 19th & 20th place finishes. The final score found Snohomish nipping Henry Jackson by a two point margin (44 to 46). Stanwood’s 86 points was good for third place over Kamiak’s 111 total. 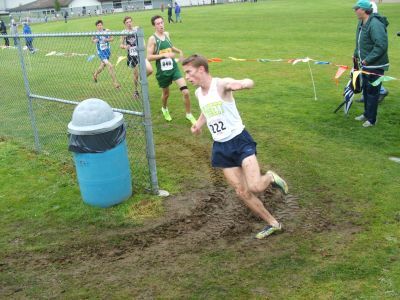 As if the wet & slick conditions did not pose enough problems, a stiff wind began at about the same time that the 3A boys’ race had started. The leaders still managed to head out of the stadium at the 1:50 mark and then reached the mile at around 5:32. At that point the race appeared to have come down to only four runners with Mason Newton’s name being one of the names being clearly cheered. The ensuing mile saw some changing of positions and it appeared to be Glacier Peak’s Michael Matwichuk, who led everyone out of the stadium at the 9:17 mark in the race. Behind him trailed a pack of three runners, who were in turn followed by another trio of runners. In the end it was Everett’s Mason Newton, who broke away, and, when he began to take the track & stride home a fan could be heard that Everett runners “get no press”. Newton took care of that issue by gliding home in a time of 16:24, which was twenty-one seconds ahead of Shorecrest ’s Carter Osborne. Jack Pearce of Mountain Terrace earned third in 16:48, while Oak Harbor ‘s Matt Reith followed in fourth only two seconds later. Keenan Stephens of Shorewood took fifth making it five runners from five different teams to come home. Everett ‘s Mattson Overstreet claimed sixth with 16:55 to top GP’s Matwichuk by two seconds. Oak Harbor’s Joshua Schrum (17:00) & John Rodeheffer (17:05) placed 8th & 9th, as Zach Smith of Glacier Peak rounded out the top ten. The team scoring saw Glacier Peak come away with a 56 to 62 victory over oak Harbor after Sam Juozapaitis, Alec Northrop & John Kaltenbach secured 12th through 14th place. 4A action among the guys saw Mason Nicol of Lake Stevens always relatively near the lead, as splits of 1:50 (out of the stadium with four other runners) and 5:12 (mile) were reeled off early. 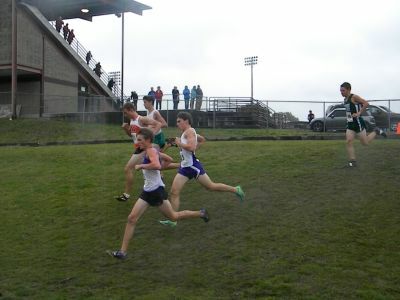 Running with Mason in the early going were Collin Hollman of Henry Jackson, Austin Wood of Monroe & Ryan Bradford of Kamiak, while Edmonds-Woodway ‘s Jack Griffing ran just behind. The fifth runner appeared to be Henry Jackson freshman Aaron Roe, who has had a fine initial campaign but without access to the bib numbers it is hard to say. At any rate a Henry Jackson runner moved into the lead over Cascade-Everett ‘s Steven Straham coming out of the woods but that changed during the next lap of the course. Nicol, seemingly always running within himself, took over the lead and then stretched a gap of seven seconds on his way to victory in a time of 16:17. Steve Stratham followed in second and Collin Holman of Jackson moved late to garner third in 16:32. Jack Griffing secured fourth two seconds later & was closely followed by henry Jackson runners Jacob Atkinson & Nick Clacat, who placed fifth & sixth. Seventh place went to Stanwood ‘s Wade Weinert (16:39) and Ryan Bradford was given the same time but in eighth. Aaron Roe took ninth with 16:39 as well Jadon Olson, also from Jackson, scored tenth with 16:42. Team-wise it was Henry Jackson, which dominated the division with a low of 33 points. 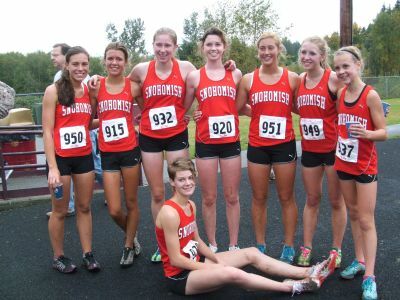 Snohomish earned second with 92 points to edge Kamiak, which followed with 95. Lake Stevens was a reasonably close fourth place with 104 points. The Cascade Conference races were the last on the card for the afternoon but the girl’s race may well have been the best race of the day individually. Rachel Cundy of Lakewood bravely led the way through splits of 2:07 and then 6:28. At the mile she was shadowed by Kacey Kemper of King’s. Behind that pair about seven meters back McKenna Smith of King’s and Lillianna Stelling of South Whidbey had their own duel. Another ten maters back trailed a trio of runners that included Michaela Bartz of Archbishop Murphy. The leaders returned to the track and at the 11:07 mark Cundy still maintained a lead of a second over Kemper, who in turn had good twenty meter lead over Bartz & Smith. There is often an ebb & flow during a race and during that time the runner, who is in the ebb portion of the run is forced to do their best to maintain contact until things change for the better later in the race. For Kacey Kemper that period occurred, while they ran for the second time in the wooded area. By the time that the two leaders had reappeared Rachel Cundy had opened up a solid twenty meter lead over Kemper. The leaders ran down the brief hill & headed to the baseball fields at the 15:38 mark in the race and it appeared, as if the race was over with the remainder being a mere formality. In only a minute the situation had changed for off in the distance at the 17:02 mark of the race Kacey Kemper could be seen in full flight scampering over the course in chase of Cundy. The Lakewood runner was finally showing signs of fatigue from her earlier effort but still Kemper was on a roll. Still even with that said, it would be hard to predict that the challenger could catch the leader but, when the runners appeared above the track at the 18:50 mark Kemper had caught Cundy and then quickly moved ahead. Soon Kemper raced ahead down the grade and hit the track displaying a graceful stride. Still the race was hardly over, for Rachel Cundy somehow fought back and as the pair headed down the final straight to the finish chute the Lakewood runner loomed just off of her rival’s shoulder. Both runners fought all the way down the final stretch but Kacey Kemper did not yield any more ground and she won with a time of 19:35 besting the valiant Cundy by less than a second. We had faced a 4 ½ hour drive back to Oregon after the race and considered leaving early but this race was one not to miss for sure. Michaela Bartz followed alone in third place with a 19:56 before McKenna Smith & Lillianna Stelling waged their own private duel for fourth with the King’s runner getting the nod over Stelling by less than a second – both at 20:06 & change. Amelia Anderson (20:32) led a trio of Cedarcrest runners including Diana Carr (20:50) & Olivia Waterman (20:57) and Lakewood’s Darby Throndsen garnered ninth in (20:58). Molly Hammontree (21:01) & Tasha Hartwig (20:03), both from Cedarcrest rounded out the top eleven finishers. With Cedarcrest placing five runners in the top eleven runners, plus Miranda Vergillo’s 13th place effort, the Red Wolves easily triumphed with a low of 42 points. Lakewood with 60 claimed second just ahead of King ‘s 63 points. The Cedarcrest guys were victorious as well and their total of 41 was good for a twenty point margin. King ‘s placed second with 61 points to edge Lakewood by two points, while Archbishop Murphy gave a good account of itself with a total of 68. The race for the Cascade boys’ title appeared early to be a wide open affair as four runners raced out of the stadium at the 1:53 mark of the race. They remained together, when they hit the clearing in the woods (3:38) and continued together through the mile mark in 5:32. At that point a fifth runner had moved into contention and ran just a bit behind the quartet. Any illusions of a thrilling last minute charge were ending in the second half of the race, when Hap Emmons of King ‘s opened up a lead with only Sam Holeman of Archbishop Murphy staying with the leader for a time. At race’s end Emmons had opened up a seven second margin with his winning time of 16:18. His time was only off by a second from being the best time of the day & considering the fact his race was last and the course was more chewed up, the effort was quite special. Sam Holeman garnered second in 16:25, while Logan Orndof of Cedarcrest edged his team mate Mitchell Montgomery with both sharing a final time of 16:28. Lakewood ‘s Kris Mugrage of Lakewood took fifth in 17:05 & was trailed by the sixth place effort of Andrew Ayers of King’s, who ran 17:10. Mitchell Darrah of Lakewood earned 7th with his clocking of 17:16 and Cody Wanichek of Cedarcrest ran 17:28. Lakewood’s Drew Cabales followed two seconds after him and Patrick Hyatt of Archbishop Murphy secured tenth in 17:35. Compliments to Jeff Sowards & his staff for running a fine program with no glitches in spite of the less than ideal conditions. We look forward to attending next year for our fourth consecutive time.